Posted in Features and tagged SVG College Sports Summit on May 31, 2016 by Sports Video Group. It’s SVG College Sports Summit week and 500+ attendees will make their way to the Omni Hotel at CNN Center to meet with industry colleagues and discuss the latest in college sports video production and technology. Here’s a quick preview of what’s to come at our seventh-annual event in Atlanta. As attendees make their way into Atlanta, everyone is encouraged to use the convenient MARTA train system to get from Hartsfield–Jackson Atlanta International Airport to the Omni Hotel at CNN Center. Take the MARTA train from the airport to Five Points Station. At Five Points Station, transfer and take the westbound train one stop to CNN/GWCC Station. From there, take the escalator or elevator up and walk through the CNN building to hotel entrance. Please be sure to join us for our big Opening Night Reception at the College Football Hall of Fame from 6 to 8 p.m. Don’t miss the drinks, networking, fun, and more at this fantastic new facility. And if you are a College Sports Media Award nominee, see your piece showcased on the big board! 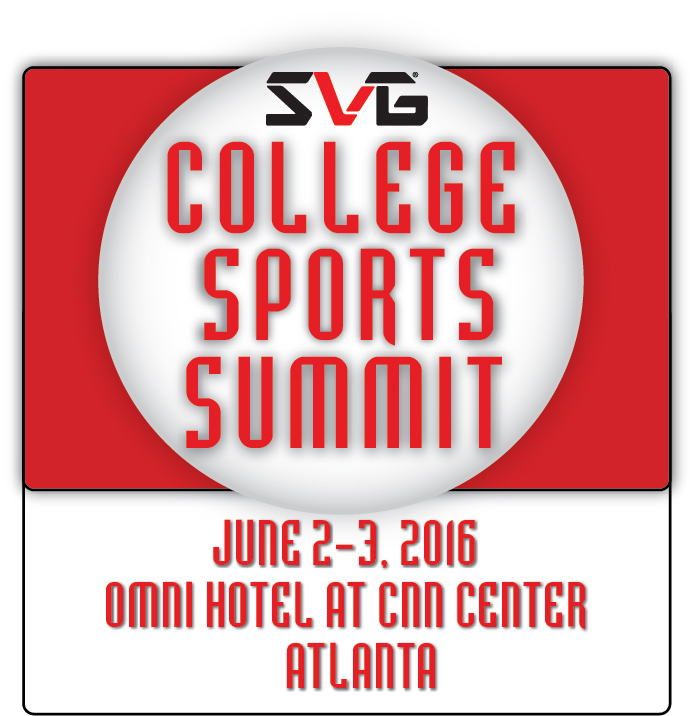 IMPORTANT NOTE: All attendees MUST retrieve their SVG College Sports Summit badge from the registration desk before going to the reception. Your badge serves as your ticket into the College Football Hall of Fame. Beginning at 9 a.m. in the International Ballroom, attendees will hear in-depth conversations on producing and directing an elite live sporting event, social video strategies, in-venue videoboard production, storage & asset management, and much more. Don’t miss what promises to be an exciting keynote from Facebook’s Rob Shaw on the best ways to get the most out of Facebook and Facebook Live. Also, attendees will be treated to a robust exhibit hall of 40+ Technology Showcases, professional networking, and the presentations of the SVG/NACDA Technology Leadership Award, SVG College Sports Summit Pioneer Award, and the SVG/NACDA College Sports Media Awards. For a full breakdown of the panel discussions on Thursday, CLICK HERE. Be sure to visit the Technology Showcases as more than 35 companies will be showing their latest and greatest in gear designed specifically to meet your production needs. Following the SVG/NACDA College Sports Media Awards ceremony (which begins at 5:15 p.m.), please join us to celebrate the winners and finalists at our CSMA Celebration Reception (6:00 p.m.) in the Exhibit Hall. The closing day of the Summit kicks off with a insightful case study from the social video team at Clemson University prior to an in-depth Keynote Conversation with America East commissioner Amy Huchthausen tackling how a mid-major conference finds success is the digital media world. From there, attendees will break out into two unique workshop tracks aimed at targeting various goals and technology segments. Track 1 will take place in the International Ballroom and will tackle content strategies. Case studies from the Missouri Valley Conference and Lafayette College. In Track 2, take your video production infrastructure to the next level by listening in on detailed talks surround closed captioning, transmission, and broadcasting live events from tough locations. For the full Friday program, CLICK HERE. We hope you enjoy your time in Atlanta. Learn, network, share ideas, and make industry friends to last a lifetime. Follow the event online on Twitter @SVGCollege and using #SVGCollege.